On this very Sunday (the 3rd of January 2010) the recordings of the first album of ReVamp has started!!! Drummer Koen Herfst is in Germany now with Waldemar Sorychta to record the drums!!! I will go there soon as well and I promise you I will start making a nice studio report! Floor has begun to record her vocals! Yay!I can't wait till the release! Floor Jansen signs up with Nuclear Blast for her new band ‘ReVamp’! Floor announces new band members! Floor to guest on Star One's new album! EPICA singer Simone Simons will join REVAMP — the band fronted by former AFTER FOREVER vocalist Floor Jansen — on stage tonight (Saturday, October 23) at the Metal Female Voices Fest in Wieze, Belgium to perform the REVAMP song "Sweet Curse". Video footage of Simons and Floor "rehearsing" for tonight's event can be viewed below. ReVamp to support Epica on 2011 UK tour!! 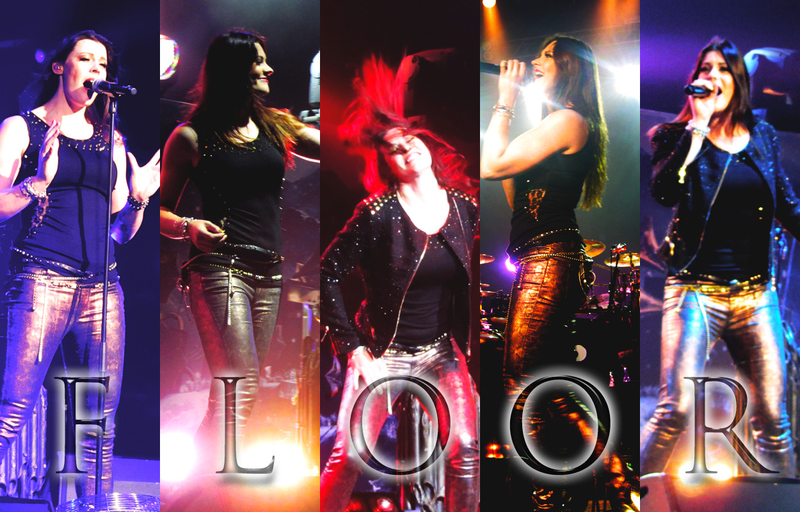 It's Floor Jansen anniversary today ! She's now 32 ! Happy Birthday, Floor! Those look great, Sophie. Loving the edits Sophie! Always fantastic! In the few years of ReVamp’s young existence the band endured many challenges and unexpected circumstances. Heavy winter storms with long periods of suffocating frost! Followed by sudden summer rains with wild streams of water that’s taking everything with it into unknown territory. A survival of the fittest! ReVamp came out stronger, more mature and with darker and more brutal music that tells the tale of this wild ride! Singer Floor: “Never before in my career I faced a situation like the one we were in with this album. It was a huge challenge because of several reasons. My sickness caused a major break between the first album and tours plus the writing of the first ideas for the second album and the actual finalization of those songs and the album. And right at the moment we started to pick everything back up after I was sick I joined Nightwish. Like a winter and a summer storm, they bring unexpected things, some nasty ones and some amazingly wonderful! Also the recording of this album was unlike any I did before because I was on tour with Nightwish most of the time. Guided by Joost van den Broek (ex-After Forever, songwriter first ReVamp album) the talented musicians of ReVamp recorded all the instruments and when I came back to The Netherlands I stepped into the studio to find a rough diamond. A shiny dark crystal: ready for my vocals. That was magical! The singing went smoother than ever before. The lyrics are like a roadmap through our storms and through my personal detours and horrors. The result of this trial will be released on album in September 2013. With pride we can announce our partner in crime from the first album will again join forces with us! Metal and rock giant Nuclear Blast will again make sure ReVamp’s new album reaches YOUR music collection wherever you are on this metal loving planet!!! When will ReVamp’s second album reach you? ReVamp will go on their first North American tour as a supporting act for Iced Earth in April! :DThe band Sabaton will also support Iced Earth. I'm probably going to go to the Atlanta show (unless anything goes wrong...) since I'm a big fan of both ReVamp and Iced Earth. I especially want to see ReVamp since I doubt they will tour here again anytime soon since Floor will be so busy with Nightwish for at least the next few years and probably won't tour outside of Europe with ReVamp.